Made from flexible and durable silicone. These number sets are made for tracing! Yellow SiliShapes® Trace Numbers include molded tracing lines and arrows for writing formation. Make your own 2D figures and skeletal 3D models! Learn about vertices, faces and edges while involved in constructing new models. Quarter curve pieces enable students to build and investigate properties of circles and cylinders. 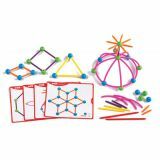 Includes 60 white balls, 50 sticks each measuring 1.29", 2.08", and 2.72", 30 each of 3.32", 4.13", and 4.92", 30 quarter circles, and 20 double-sided activity cards. 330 pieces. Children are introduced to basic geometric shapes as they build two and three dimensional structures. 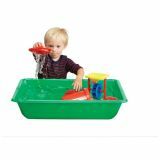 Improves fine motor skills, as well as develops creative and problem solving skills. 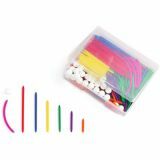 Set includes 80 sticks in 4 sizes and 4 colors, 40 connecting balls in two colors, 24 quarter circles, and 20 two-sided full-color activity cards in a sturdy plastic container. Children create fun patterns and different designs with plastic pegs and boards you can use again and again! 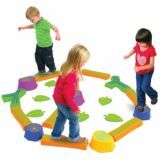 Simply push the colorful pegs into the transparent board matching the colorful pattern or activity of their choice. 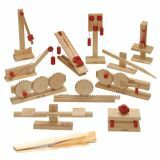 Small Pegs Activity Set will give kids inspiration for patterning, sequencing, symmetry, sorting, and early math activities. Or they may create their own patterns and let their creativity take over! Each 6-1/4" x 6-1/4" pegboard has 100 holes in total. The 600 colored pegs measuring 3/8" x 3/4" come in 6 different colors: red, orange, yellow, green, blue, and purple. 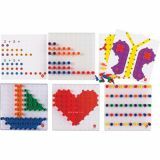 Set includes 600 pegs in 6 bright colors, 4 clear pegboards and 15 double-sided cards (30 activities). Identify parts of speech in a sentence context! 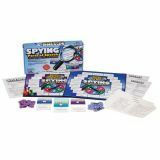 Two game boards and three card sets make precise prescription possible: Set A (nouns, verbs), Set B (nouns, verbs, adjectives), or Set C (nouns, verbs, adjectives, pronouns). Involve 4-6 players when both games are in play. 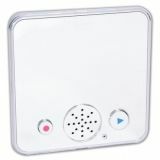 A practical learning tool for any classroom! Teach card games or probability with this traditional deck. Cards are coated for durability. 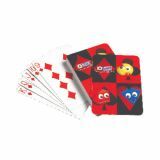 Set of 52 playing cards includes two jokers. This unique, write-on/wipe-off time tool allows students to measure time in a number line format where they can visually see where the time goes! 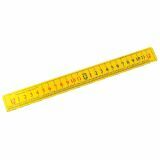 17" x 1-3/4"
This unique, write-on/wipe-off time tool allows students to measure time in a number line format where they can visually see where the time goes! 17" x 1-3⁄4"